Who knew that when Carolyn moved into her townhouse in 2003, she’d meet the man of her dreams, Joe, right across the street? What did they first learn about each other? Both shared a love for Disney and all that it represents. Before becoming neighbors, both had traveled extensively to Disney destinations, with family and friends, with and without children. And who would have thought that 8 years later, they would be sharing their passion for Disney with others? As neighbors, as friends, they took their first Disney vacation to Disneyland in California, which is where the magic began. They had their first kiss in front of Sleeping Beauty Castle. They said their first “I love you” on Main Street and from there, their life has been nothing short of grand. Through the help of friends and connections, they were engaged at Walt Disney’s private (members only) club located in the New Orleans Square section in Disneyland – Club 33. Their wedding had Disney flair laced throughout. Their wedding song was “You’ve Got a Friend in Me” from Toy Story. 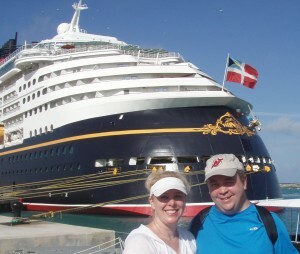 Their honeymoon, of course, was Walt Disney World and a Disney cruise on the Wonder. It doesn’t get any more magical than that! 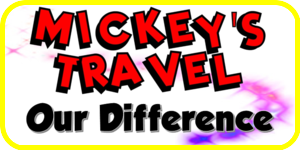 As husband and wife, we joined Mickey’s Travel in 2011, providing us an opportunity to share our Disney desire with others. We became “experts” by experience and wish to share our knowledge with you. “All the little things we do will make the big difference in your vacation”. 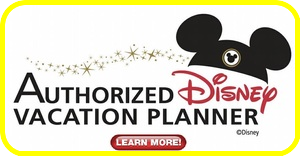 Let us help you make your dreams come true. Joe-EPCOT. I like the story that EPCOT started as two separate park designs that happened to be pushed together and the decision was made to combine these two unique concepts. I like walking directly into the future and the wonder contained in Future World and that it makes way for the brotherhood of nations in World Showcase. Doesn’t hurt that my favorite attraction is there either. Carolyn-Disneyland because it was the first park Joe and I went to as well as Walt’s first park. It was also where I got engaged-so that makes it extra special. I love how small it is yet how big it is. I love that it’s just a little bit different in every way than Magic Kingdom. I love that I can walk to this park without waiting for transportation. I also love seeing my personalized brick in the walkway in front of the main entrance gates. Joe-Mission Space. As much as I really miss the original Horizons attraction that used to occupy this space, the uniqueness of the Mission Space attraction makes it a winner for me. Joe-Club 33. I’d always heard rumors about the existence of a secret club in Disneyland and I could not believe my good luck to be able to go there. Thanks Bear! Carolyn-The Plaza in Magic Kingdom has been my favorite for as long as I can remember. There is nothing overly fancy about The Plaza but I love how old fashion it is and love seeing the castle while I eat. My favorite room is the small side room. I love the food and especially the dessert! Joe-Mickey. Mickey embodies that lifelong work of Walt Disney and everything he stood for. Carolyn-Mickey for no other reason than he’s what it’s all about. Joe-Pirates of the Caribbean-Curse of the Black Pearl. Compelling characters portrayed as if they were a dark ride in the first Pirates movie. I especially appreciated the musical score by Klaus Badelt and felt that the musical score for the series reached its peak in this movie.